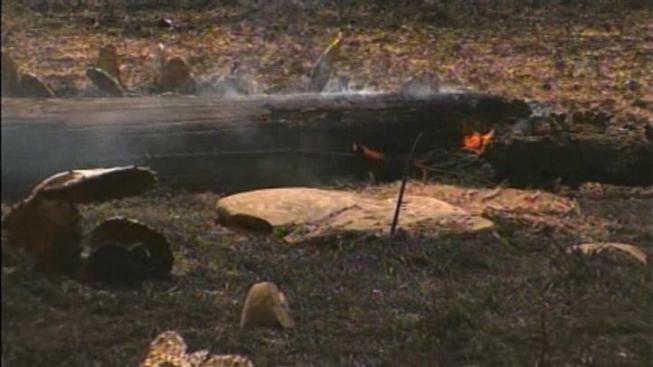 The spread of a large brush fire near Possum Kingdom Lake slowed down on its fourth day. 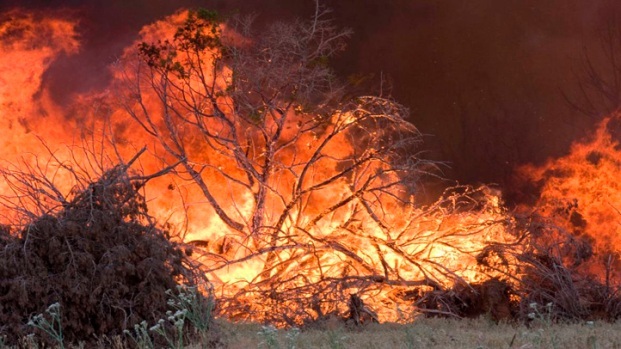 The Texas Forest Service said Friday that the blaze, which has burned more than 6,600 acres, is 60 percent contained. Tom Berglund with the TFS said Thursday that crews got the upper hand on the 101 Ranch fire overnight after setting a perimeter around all possible areas to where the fire could spread. So far, the fire has destroyed more than three dozen cliff-top homes, nine recreational vehicles and more than 6,200 acres of land dotted with parched brush and cedar trees. Most evacuees have been allowed to return to their homes in the Possum Kingdom Lake area. Power was restored to two subdivisions; Sportsman's World and Gaines Bend. But the hardest hit area, The Cliffs, remained closed Friday night. The area still has hazardous material, and firefighters are "mopping up," or putting out hot spots and cleaning the area so that it's safe for residents, said Texas Forest Service spokesman John Nichols. Three hundred firefighters worked to contain the fire Friday with the help of several helicopters and CL-215 planes used to scoop water and then dump onto the fire. Most of Possum Kingdom Lake is open for Labor Day business. The fire was expected to become easier to manage because it moved into new, flatter terrain with less vegetation for fuel. Cooler temperatures forecasted through the weekend should provide some relief to firefighters battling the wildfire. Evacuations were lifted for three neighborhoods that were evacuated Wednesday, including the Peninsula, Harbor and Ranch. 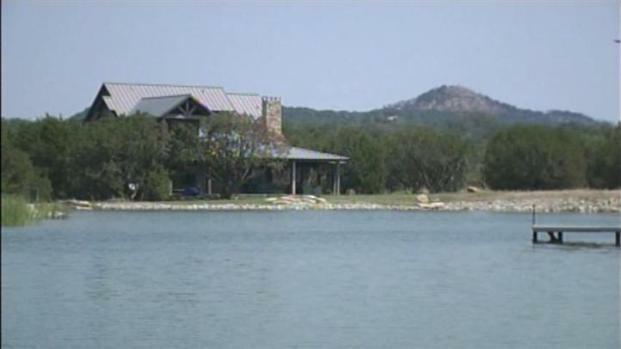 Even with the fire, Possum Kingdom Lake remains open for Labor Day weekend. If the fire poses a threat to those at the lake, an evacuation will be ordered. 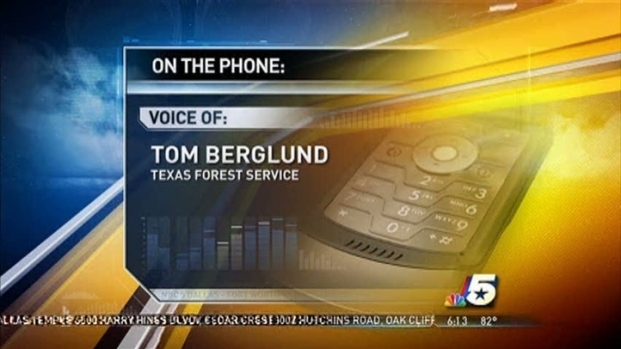 Tom Berglund with the Texas Forest Service gives an update on the 101 Ranch fire Thursday morning. Business owners said they are prepared for the holiday weekend, which is traditionally one of the best weekends for lake business. "It's big because it's the last big hurrah before the end of the season," said Gary Long, who owns several businesses in the area. The summer has been a tough one for business owners, who said the fire, a lack of rain and low water levels have ruined profits. A couple who lost their home in The Cliffs to the 101 Ranch fire say they are grateful no lives have been lost. But Nichols warned lakegoers to be cautious of the on-going air operations. Lake rangers will try to keep boaters away from areas where planes will be scooping water, but he warns that boaters should stay away. Possum Kingdom lake levels are lower than normal, but many public docks remain open. 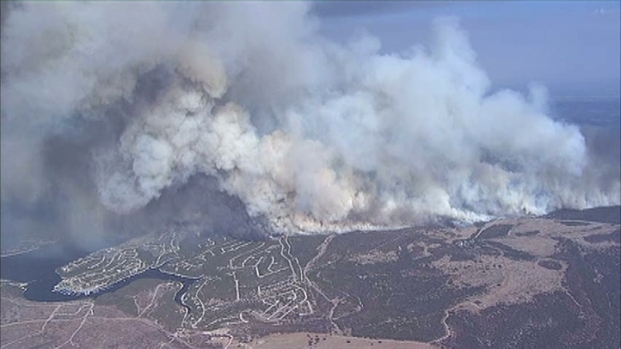 More homes are threatened tonight as wildfires continue to burn along Possum Kingdom Lake. The 101 Ranch fire started burning Tuesday to the north and northwest in an area north of U.S. 180 on both sides of State Highway 16 just south of the lake. The wind-whipped flames quickly consumed several thousand acres with flames reaching up to an estimated 150 feet in the air. The massive fire has been known to jump across roadways and is estimated to have destroyed about 40 homes through Thursday morning. The Cliffs neighborhood, where about two dozen of the damaged homes were located, was one of the few areas not hit during the wildfires that burned large portions of the Possum Kingdom Lake area in April. "The fire itself is pretty much out of control," Palo Pinto County Sheriff Ira Mercer said Tuesday afternoon. "This fire is not something that you can battle from the ground. The flames are jumping 150 feet in the air. It's not something you can put personnel in on." A massive fire continues to burn through brush land near Possum Kingdom Lake. 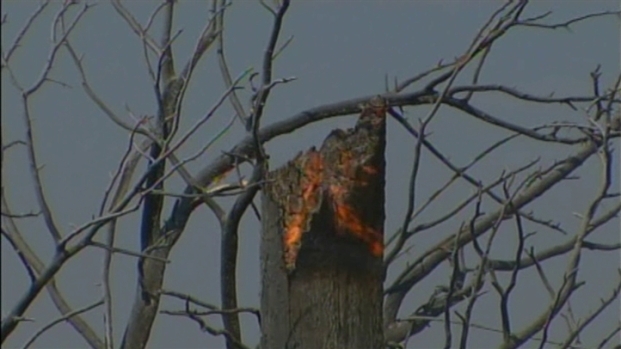 Berglund has said the vegetation is so dry that it burns explosively. Firefighters were able to establish an anchor point overnight Tuesday from where they expanded their ground attack Wednesday. Additionally, two large aircraft carrying fire retardant attempted to cut off the fire and protect threatened homes. On Wednesday afternoon, the Brazos River Authority announced that Neely Slough would be closed to all boat traffic except emergency vehicles because of the wildfire. Neely Slough is the large inlet located near The Cliffs Marina and will be patrolled by the Brazos River Authority and Texas Forest Service. 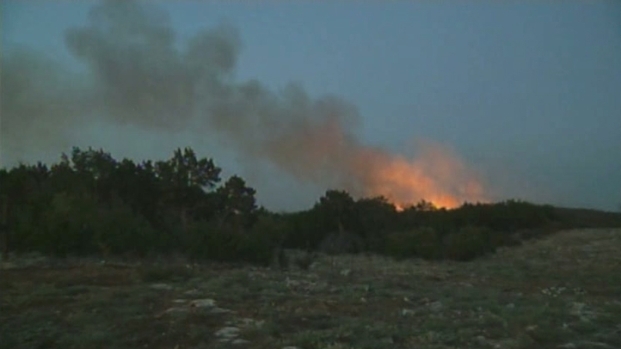 The Texas Forest Service says the 7,500-acre fire has burned at least 20 homes in the Possum Kingdom Lake area. Multiple fire departments are working to contain the wildfire, and several aircraft are assisting in the fight including two heavy helicopters, two air-based coordinators and six single-engine air tankers. Three strike teams of Texas Intrastate Fire Mutual Aid System engines have been requested as well. Agencies responding to the 101 Ranch fire are the Texas Forest Service, Haltom City Fire Department, Texas Division of Emergency Management, Texas Department of Public Safety, Hurst and multiple agencies with Palo Pinto, Jack, Erath, Young and Stephens counties. Federal Aid for August Wildfires? NBC 5's Omar Villafranca explains the process for requesting federal aid after the August wildfires in Palo Pinto and Wise Counties. Officials closed SH16 from 180 to Farm-to-Market Road 2353 on Tuesday. Homes in the Garland Bend neighborhood, The Cliffs and the Marina were all evacuated Tuesday. 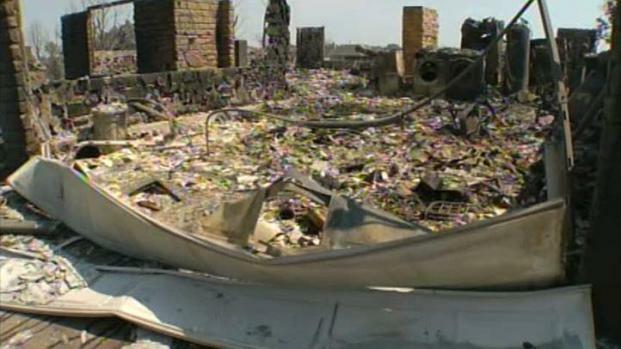 "There was a big wall of fire coming down the main road to our development. We had a boat in the water and decided to take that across the water -- and that's what we did," said Jackie Fewell, Possum Kingdom Lake resident. "We could see it certainly burning in The Cliffs and we knew it was burning, somewhat, in Gaines Bend." Fewell said this is the second time this year they've evacuated because of wildfires. "This same neighborhood was really devastated in April and we felt like our home would be OK, but you're just so anxious for your friends," Fewell said. "We've got good friends that we knew who lost their home." Kathy Lanpher, whose home in Gaines Bend burned down in April, told The Fort Worth Star-Telegram that the latest blaze chased her from her new abode, a condo in The Cliffs nearby. Lanpher said she grabbed her dog and laptop, drove to a marina on Possum Kingdom Lake and jumped on a pontoon that took her to safety. She said she was among some 50 residents who decamped to The Harbor Restaurant for the night. 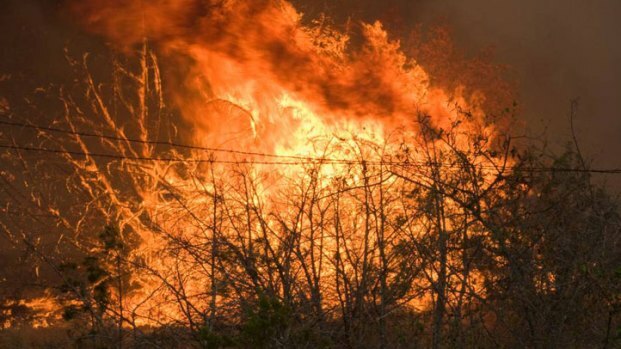 April's massive wildfire burned about 125,000 acres in the Possum Kingdom Lake area and destroyed some 160 homes and two churches. Barbara Wright, who also evacuated for the second time this year because of Tuesday's fire, said, "God took care of us the last time. He'll do it again. It's been very sad, but we'll rebuild." No major injuries have been reported. One person is said to have suffered minor burns and two firefighters were treated and released Tuesday night for ankle injuries. Texas is currently fighting the worst fire season in state history. In all, firefighters have responded to more than 20,000 fires that have burned more than 3.5 million acres since Nov. 15, 2010. As of Thursday, there are currently 14 active wildfires in the state. NBC 5's Scott Gordon, Ellen Goldberg, Kim Fischer, Susy Solis and Ken Kalthoff contributed to this report. 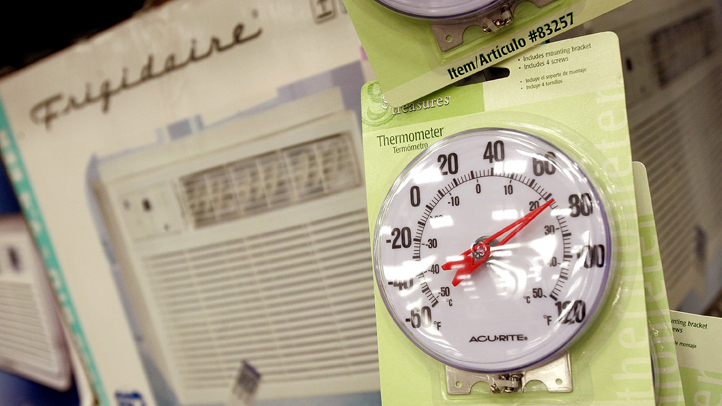 We're covering the record heat, wildfires, and electricity concerns in our Heat Wave 2011 special section. View videos, photos, and stories about the high temperatures and related conditions in this section.